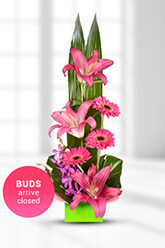 Most standard floral orders delivered to metropolitan areas have a reduced delivery charge of 15.50NZD. My friend was delighted with her flowers. Great selection, competitive prices, fast delivery. Everything went smoothly. I had a change to my order and was able to change it with ease. Thank you very much. Excellent. Although I had spelt the street name wrongly Noni rang me first and then tracked down the correct address. I appreciate this very much and would definitely recommend this company. The flowers were delivered on time and appreciated. Always good quality and delivered in a timely manner. We have been using the service regularly. Very Happy with the service.